Necklace "Sea and the Moon" - NEW!!! 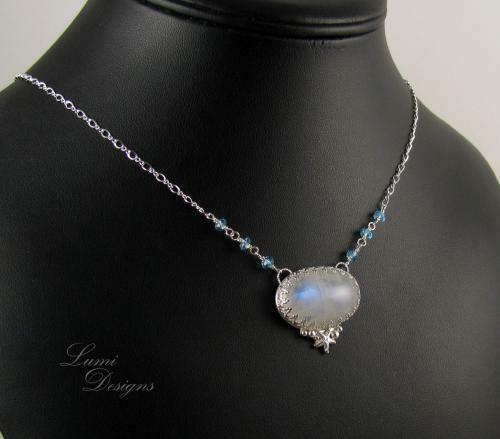 For centuries, Moonstone has been used to contact the energies of the moon. The rhythms of the Moon play an important role for all those living on Earth and Moonstone helps us understand the cycles of life and their importance. Every cycle that we live through increases our wisdom, beliefs and knowledge. Moonstone also develops our intuition and makes our psychic abilities grow. In addition, Moonstone has a calming effect, it relieves anger and helps to see the reasons behind our problems.